US boycott campaigners encourage colleagues to refuse complicity with Cornell University’s partnership with Israel’s Technion Institute, French company Veolia loses yet another contract in London, dozens of musicians and performers heeded the Palestinian-led call for boycott, divestment and sanctions (BDS) and refused to perform in Israel in 2011 while the cultural boycott campaign gears up for a new year, and more. The US Campaign for the Academic and Cultural Boycott of Israel (USACBI) released a statement expressing “grave concern” about an announcement by Cornell University to partner with Technion Israel Institute of Technology in building a joint campus — NYCTech — on Roosevelt Island in New York City. The project, which will cost $1.5 billion to build, including $100 million in public funds, “is intended to bolster job creation in the city and may generate 600 spinoff companies and $23 billion in economic activity over the next three decades,” according to NYC Mayor Michael Bloomberg at a news conference on 19 December. However there was no mention of Technion’s role in major human rights abuses and its collaboration with Israeli weapons manufacturers whose arms have been and are currently used to kill Palestinians. Israeli academic institutions provide the technological foundation for Israel’s military occupation and colonization of Palestine, Syria’s Golan Heights, and of southern Lebanon. They provide the knowledge that undergirds Israel’s ongoing colonial project. Technion, like all Israeli academic institutions, is deeply complicit with Israel’s military, providing it with the technological infrastructure to maintain and expand its ethnic cleansing of Palestinians from their land. Technion’s partnership with Elbit Systems, one of Israel’s largest private weapons manufacturers, has played a leading role in the construction and surveillance of the Apartheid Wall in Palestine as well as along the U.S.-Mexico border with its subsidiary Kollsman. Technion trains its engineering students to work for companies like Elbit dealing “directly in the development of complex weapons in the process of researching their academic theses.” As a reward, Elbit has been funding research grants in upwards of half a million dollars to Technion’s students conducting research. Technion’s deep relationship with the Israeli military also includes work with Rafael Advanced Defense Systems, one of Israel’s largest government-sponsored weapons manufacturers famous for its “advanced hybrid armor protection system” used in Israel’s Merkava tanks. Technion developed an “MBA program tailored specifically for Rafael managers” in order to solidify its relationship between academia and Israel’s military-industrial complex. Like its peer institutions in Israel, Technion rewards its students who perform their compulsory military service. Technion, however, also grants Israeli army reservists who participated in the Israeli massacre of Gaza in 2008-2009 “academic benefits in addition to the usual benefits for reservists.” This is in addition to a number of benefits that Technion and other Israeli academic institutions grant to those who serve in the Israeli army. Thus, not only does Technion participate in the development of weapons used to massacre and oppress Palestinians, it also rewards those students most actively involved inside and outside the classroom. Moreover, while rewarding Jewish students who serve in the Israeli army, Technion participates in the Atidim program while actively discriminating against Palestinian citizens of Israel. We call on our colleagues — students and faculty alike — at Cornell University to join our peers at McGill and Concordia Universities in Canada to refuse complicity in Israel’s military-industrial complex. Cornell’s project means the active participation in an apartheid regime that oppresses Palestinian, Syrian, and Lebanese people through its military apparatus, bolstered by its academic institutions. We call on our colleagues to stand in solidarity with the Palestinian call for boycott, divestment, and sanctions until Israel meets its obligations to recognize the Palestinian people’s inalienable right to self-determination and fully complies with the precepts of international law by: 1) ending its occupation and colonization of all Arab lands and dismantling the Wall; 2) recognizing the fundamental rights of the Arab-Palestinian citizens of Israel to full equality; and 3) respecting, protecting, and promoting the rights of Palestinian refugees to return to their homes and properties as stipulated in UN resolution 194. The UK-based Palestine Solidarity Campaign (PSC) officially welcomed the International Chemical Energy and Mineworkers federation’s (ICEM) call for a comprehensive divestment from “companies who profit from illegal settlements, the occupation and the construction of the wall.” The ICEM also called for the dismantling of Israeli settlements and the wall in the West Bank including East Jerusalem, and the full implementation of the right of return for Palestinian refugees under UN General Assembly Resolution 194. Hugh Lanning, Chair of the Palestine Solidarity Campaign, said: “PSC warmly welcomes ICEM’s support for action to target firms profiting from Israel’s occupation, settlements and wall, which echoes the policy overwhelmingly passed by the British TUC in 2010 and reaffirmed in 2011. It demonstrates the breadth of support for Palestinian rights and reaffirms the principle of trade union solidarity with those struggling against injustice and oppression. Companies are paying the price for their complicity with Israel’s crimes. Veolia has lost contracts worth millions of pounds, with the glad tidings just before Christmas of the loss of a contract worth £485 million ($748 million) in West London. Agrexco, infamous for exporting produce from Israel and the illegal settlements, went into liquidation. Companies and organizations must recognize that they must end their complicity with occupation and war crimes. Another multi-million dollar contract was rejected for French urban systems corporation Veolia in London late last month. The decision by the West London Waste Authority to award the contract to a different company was celebrated by boycott campaigners, who have been tirelessly pressuing city council officials to exclude Veolia from operations in the UK. Veolia, which has played a major role in the construction and administration for the illegal Jerusalem light-rail train that will connect West Jerusalem to illegal settlements in the West Bank, has lost hundreds of millions of dollars in contracts over the past year as boycott campaigners continue to target the company as a complicit partner in human rights violations. Over the last six months campaigners lobbied Councillors and Council officials to exclude Veolia from the contract and submitted a letter to the WLWA - signed by nearly 600 local residents - documenting Veolia’s direct complicity in grave breaches of international and humanitarian law in Jerusalem and the West Bank. … Veolia’s failure to win the WLWA contract is a heavy blow for the company because it owns a domestic waste depot in the area covered by the WLWA and so should have been ideally placed to meet some of the necessary criteria for the WLWA tender. Worse still for Veolia, this blow comes only six months after it failed to win Ealing Council’s £300 million ($463 million) new ‘Clean and Green’ contract even though Veolia already did much of the work under the old contract. When bidding for that contract Veolia had faced determined opposition from Palestinian rights campaigners over its track record in Jerusalem and the West Bank. The year 2011 was a year full of many successes in the campaign for the cultural boycott of Israel. This summary will focus on the cultural boycott with emphasis on musical artists and groups. The fall of South African apartheid was preceded by many musical artists who joined to create a movement. That movement became known popularly as “I’m not gonna play Sun City.” Israel has not yet seen its Sun City moment fully, but as you’ll see, significant rumblings are beginning. From Jon Bon Jovi to Roger Waters to Pete Seeger to Kareem Abdul-Jabbar to Jello Biafra to Tuba Skinny to the Yardbirds, and dozens more, 2011 was an important year for boycott campaigners around the world and for the BDS movement in general. The Palestinian Campaign for the Academic and Cultural Boycott of Israel (PACBI) welcomes the cancellation of Joker’s scheduled performance in Israel. We appreciate his willingness to dialogue with our supporters and to take the time to learn about and reflect on Israel’s violations of international law and the human rights of Palestinians. We do, however, wish to address some stated reasons for his cancellation reported in various press, which included his concern over violent threats that he may or may not have claimed activists had made against him. PACBI, a key member of the Boycott, Divestment and Sanctions (BDS) National Committee (BNC), treats such concerns with grave urgency, especially that this accusation is not the first of its kind leveled against our movement. PACBI strongly and unequivocally condemns any violent threats made against Joker or, for that matter, against any other cultural or academic figure who decides to visit Israel in violation of the Palestinian boycott of Israel. As a civil resistance movement whose message is anchored in an unwavering commitment to universal human rights and ethical responsibility, we strive to persuade people, to appeal to their minds and hearts to boycott Israel — through campaigns of public awareness raising and morally sound, non-violent pressure — due to its occupation, racist oppression and unique system of apartheid. Violent threats are never issued nor endorsed by the BDS movement. While we have strong reason to believe that these threats may have originated from and are being employed by the state of Israel, and/or its lobby groups, to tarnish the image of BDS activists, we do wish to appeal to our supporters to remain true to the spirit of BDS as an ethical force that subscribes to the highest principles of human rights and international law. As such, we urge our supporters to be diligent and mindful of these principles in communicating with artists and other cultural figures in the future. We still strongly condemn all those who decide to cross our boycott picket line and allow themselves to be used in whitewashing Israeli occupation and apartheid. Though 2011 was a success, BDS activists are gearing up for a full year of cultural boycott campaigns on the agenda. Australians for Palestine has put up this comprehensive list of all the upcoming international performers scheduled to play in Israel through August, with contact email addresses and Facebook groups. We are especially surprised that you would decide to perform for apartheid given your generally anti-fascist persona and progressive reputation. In a recent interview, you claimed that the Arab Spring inspired your new songs, and that “revolution, rebellion and personal freedom” have been central themes in your lyrics. Playing in Israel and singing these new songs would be ironic given that Palestinians have been part of the Arab Spring, being gunned down by the Israeli military as they peacefully protested in the West Bank and Gaza, and at the borders in Lebanon and the Syrian Golan Heights. The revolutionaries in the Arab world have connected their oppression to the oppression of Palestinians through art, music and political slogans. It would be terribly inconsistent if you were to entertain apartheid while claiming to be inspired by the Arabs’ struggle for freedom from oppression. If you care about moral consistency, we ask you to reconsider your performance. More on the Arch Enemy boycott campaign can be found on their facebook page, https://www.facebook.com/Arch.Enemy.Resist.Apartheid.Israel. Their performance is scheduled for 24 January. Additionally, the Zazafl blog has listed several facebook campaigns to encourage international performers not to play their scheduled gigs in Israel. *Editor’s note: The section “Cultural boycott successes of 2011” has been amended. It had previously stated that PACBI compiled the list of cultural boycott victories. 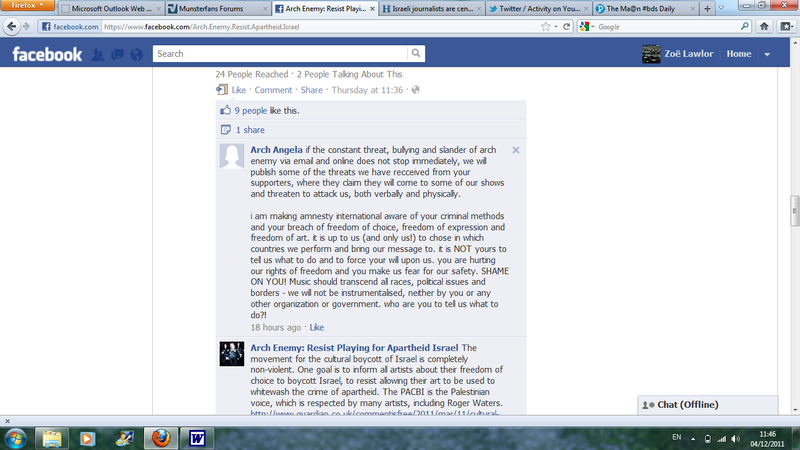 Don’t Play Apartheid Israel (DPAI) was the author of this list. I could not find the above referred to list that the PACBI complied under their statements at http://pacbi.org/einside.php?i.... please help.